Many people are pleased that typical winter temperatures have taken so long to show up. Below are some interesting observations from early- to mid-winter in New Brunswick. Relatively warm soil temperatures (as high as mid-60s °F) stimulated growth late into December. Dandelion bloom on 15 December 2015 in New Brunswick. Removed the permeable growth cover (folded up behind Kyle Genova) from our K-Microdochium Patch trial to mow it on 16 December 2016! Annual bluegrass can go to seed about anytime of the year but this is a first for me — lots of annual bluegrass seedheads on 28 December 2015 in New Brunswick. 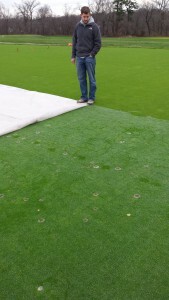 Kyle Genova pulled back the permeable turf cover from the K-Microdochium Patch trial on 28 December 2015. 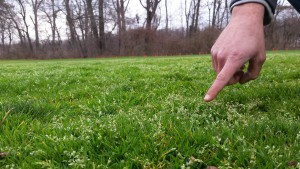 The annual bluegrass was still growing enough to schedule another mowing. And the progress of the Microdochium Patch inoculation was expanding (good for the research but ugly!). No disease response to potassium at this point. 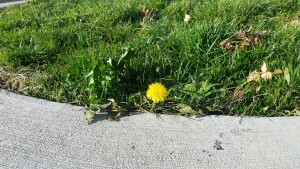 Odd to find weed species that are normally gone by this time of the year. Killing frosts/freezes are finally here and frost sensitive plants should be damaged and won’t persist much longer. 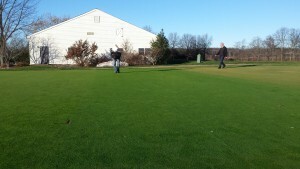 Cool-season turfgrasses will transition into dormancy if freezing temperatures linger for a while. But it won’t be too long (66 days until spring, 20 March) before annuals like prostrate knotweed will germinate and start to emerge from bare soil areas. Don’t recall prostrate knotweed (annual) persisting into January. 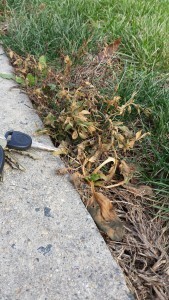 But freezing temperatures have finally killed the knotweed. Also note that the leaves of broadleaf plantain (perennial) have just now been frost damaged.